Experts have warned that the cracks could lead to a “catastrophic accident” releasing clouds of radioactive contamination over Glasgow and Edinburgh. But Hunterston’s operator, EDF Energy, insisted that the reactor was safe – and is bidding to relax safety standards so that it can be restarted. Reactor three at Hunterston B nuclear power station originally started generating electricity in 1976, and is the oldest in the UK run by EDF. It has been closed down since 9 March 2018 so that its graphite core could be inspected for cracks. The reactor was initially due to restart on 30 March, but the date has been repeatedly postponed as more cracks have been found. EDF is now hoping for permission from the UK government’s Office for Nuclear Regulation (ONR) to fire up the reactor on 18 December. The Ferret revealed in April that new cracks had been discovered in the reactor, but at the time neither EDF nor ONR would say how many. In May EDF said that 39 cracks had been found and they were “happening at a slightly higher rate than modelled”. Now we can report that more than 350 cracks have been discovered in reactor three. According to ONR, 350 is the “operational limit” in the safety case that determines whether or not the reactor is allowed to operate. EDF has told the local Hunterston Site Stakeholder Group that it was likely to propose to ONR that reactor three in future be permitted to run with up to 1,000 cracks. EDF has also closed down the adjacent reactor four at Hunterston to check for cracks, but hopes to reopen it on 30 November. 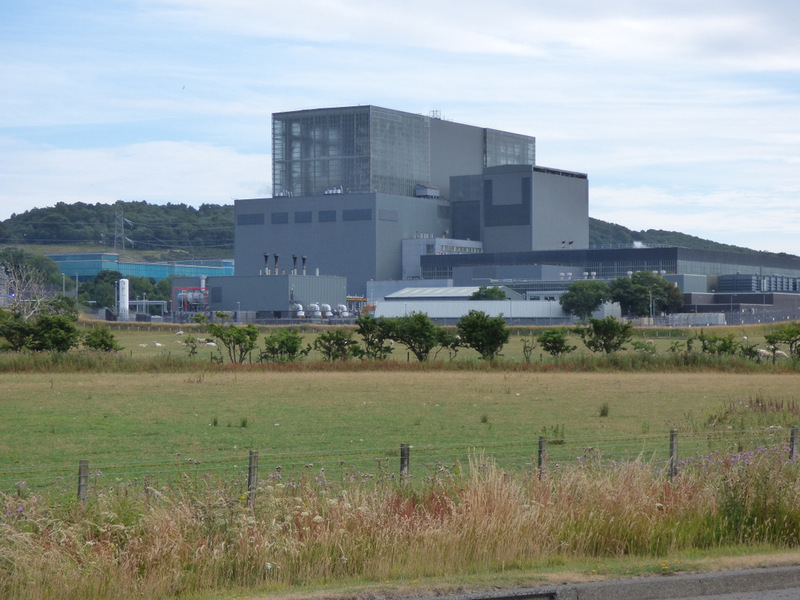 Whether or not ONR allows Hunterston reactor three to restart, and under what conditions, will have major implications for the life of EDF’s other nuclear power station in Scotland at Torness in East Lothian. It will also impact five EDF nuclear plants in England. The 3,000 graphite blocks that make up the cores of advanced gas-cooled reactors such as those at Hunterston B and Torness are vital to nuclear safety. Their integrity enables the reactors to be cooled and safely shut down in an emergency. But bombardment by intense radiation over decades stresses the blocks, producing cracks at the base of key slots known as “keyway root cracks”. If enough of the blocks fail, experts say, nuclear fuel could overheat, melt down and leak radioactivity in a major accident. The independent nuclear engineer, John Large, has previously argued that Hunterston reactor three should be permanent shut down. Before he died on 3 November he was helping radioactivity consultant, Dr Ian Fairlie, prepare a presentation on Hunterston. Fairlie, a former adviser to the UK Department for Environment, Food and Rural Affairs, shared Large’s concerns. “I worked closely with John Large in the weeks before his untimely death,” he told The Ferret. Large was concerned about the cracking causing graphite blocks to split, making the system of interlocking blocks in the reactor core less stable. “As a result, any untoward event such as a steam surge, sudden outage or earth tremor could result in a serious accident – a large release of radioactive gases,” Fairlie said. News that 350 keyway root cracks have now been found meant that over 10 per cent of reactor three’s blocks had split, according to Fairlie. He said that EDF’s computer modelling had failed to predict such a high level of cracking. Fairlie presented his findings to a recent meeting in Kilmarnock of the Scottish group of Nuclear-Free Local Authorities (NFLA). The group is intending to write to ONR’s chief nuclear inspector seeking a meeting, and to alert politicians at Holyrood. “The analysis provided by Dr Ian Fairlie over increasing keyway root cracking of the Hunterston B reactors is of real concern,” said NFLA Scotland convenor and Glasgow SNP councillor, Feargal Dalton. Rita Holmes, chair of the Hunterston Site Stakeholder Group expressing her personal opinion, accused EDF’s experts of getting their predictions wrong. “If safety were indeed EDF’s number one priority, then reactor three would remain shut down,” she argued. Holmes questioned whether a new safety case allowing far more cracks would be any more reliable. “There’s a lot at stake if the experts are wrong again,” she said. ONR confirmed how many cracks had been found. “A conservative assessment of the inspection results shows that the number of cracks in reactor three exceeded the operational limit of 350 cracks in the existing safety case,” said an ONR spokesperson. ONR declined to speculate about what it would decide on restarting the reactor. “We understand that EDF Energy is currently working on a revised safety case to justify a return to service of reactor three,” said the spokesperson. EDF Energy stressed that nuclear safety was its overriding priority. “We have carried out the most extensive inspection programme on an advanced gas-cooled reactor station to date at Hunterston B,” said a company spokeswomen. She added: “The most recent results support the work we are doing on the long-term safety case and underline our confidence that the normal operations at the station are unaffected and that there would be safe shutdown in the event of a one in 10,000 year earthquake. The Scottish Government emphasised the need for tough safety standards, but highlighted Scotland’s dependence on nuclear electricity. “It is essential the strictest environmental, safety and security requirements are met at all nuclear installations,” said a government spokesperson. The Scottish Government also stated that it was opposed to new nuclear stations “under current technologies”. But it pointed out that Hunterston B and Torness currently made a “significant contribution”, accounting for over 40 per cent of electricity generated in Scotland in 2016. “Our continued opposition to new nuclear generation does not preclude extending the operating life of Scotland’s existing nuclear stations provided that strict environmental and safety criteria are met,” the government said. Update: On 22 November 2018, Reuters reported that EDF Energy had further delayed the scheduled dates for reopening Hunterston reactors three and four. The company also wrote to the Site Stakeholder Group in response to our story. This story was updated on 7 December 2018 to make clear that Rita Holmes, chair of the Site Stakeholder Group, was expressing a personal opinion. Photo thanks to Thomas Nugent under this Creative Commons Licence.